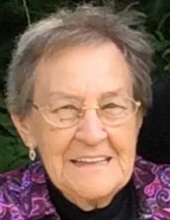 Eunice C. Karbon (Vaughan), age 85 of Rhinelander, WI, passed away on Friday, March 29, 2019, at Ascension St. Mary’s Hospital. She was born on April 18, 1933, in Manitowoc, WI to Adolph and Verna (Knuell) Karbon. Eunice graduated from Lincoln High School in Manitowoc in 1951. She married Richard Vaughan on February 26, 1955, in Manitowoc and together they would raise their family of seven children. In addition to her role as mother, Eunice worked in health care for much of her employment career. She and Richard also operated Country Club Manor Resort on Boom Lake near Rhinelander in summers; returning to Fond du Lac each fall for Richard’s teaching position. They took over fulltime operation of the resort in 1986 until retiring in the late 1990s. Eunice enjoyed cooking, baking, crocheting, needle work, and time spent with her family. Eunice is survived by her seven children, Gary and Sharon (Costello) of Kimberly, WI, Holly Hassell of Rhinelander, Suzi Perron of Sparta, WI, Gordy and Julie (Ellingson) of Fond du Lac, WI, Vernali Vaughan (John Walkowski) of Rhinelander, Jeni Vaughan of Rhinelander, and Jami Vaughan of Monico, WI; nine grandchildren, Christy, Kevin, Greg, Josh, Brandon, Amy, Rachel, Wade, and Eric; ten great-grandchildren with another expected in May; and a brother, Allen Karbon of Manitowoc, WI. She was preceded in death by her parents; a brother, Gordon; and two sisters, Geraldine and Germaine. The family is planning a memorial gathering for later this year in Manitowoc. Carlson Funeral Home (715-369-1414 / www.carlsonfh.com) of Rhinelander is assisting the family with arrangements. "Email Address" would like to share the life celebration of Eunice C. Karbon (Vaughan). Click on the "link" to go to share a favorite memory or leave a condolence message for the family.